Mina Leyton showed us the Methodist church across the street from the Hospital Metodista. There were two main buildings. 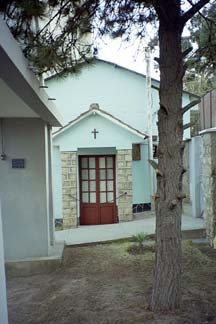 The original church, (see photo) which is currently being used as a childcare center and the new church. The original church is where Dad would get elbowed in the ribs by Doc when his dog would come in the church during Sunday's service looking for him.